The biggest challenge in brochure design… is the golden area 3” inches from the top. Your HEADLINE needs to be spectacular! And it could very well NOT be your logo. Remember, you are attracting your best client who does not know your business. Deliver a compelling headline and graphic images that are uncluttered. Your logo can be shown further down or on the back. What is the one thing that defines a brochure? It’s the fold! Most people consider the fold as a barrier. When your graphic and message takes full advantage of the entire continuing surface, it naturally compels the reader to open and unfold. Compelling headlines are the first step to delivering a concise message. Think about it. You have seconds to intrigue the reader to learn more. Make sure to have a great delivery at the beginning of each paragraph or section. If you can create a headline for each paragraph it is even better. Avoid using black. Readers are generally not ‘sight’ challenged or color blind. We see too many brochures using black text/type. If you want to make an impression, be more creative. One accent color and a neutral color is all you need to make your copy stand out. Unique shapes: Thinking beyond the standard brochure shape can help you stand out. Consider where the person who receives your brochure is going to put it. A pocket? A trade show bag? Small can be big when you consider your customer first. Paper stock: Thin is not your friend. Good paper stock communicates quality. It also matters when the paper is folded. Sad and bad is when you see cracks in the fold and image bleed through. Finish: A gloss coating is popular but not always the best choice. We like spot gloss on the areas that matter. Having a matte surface everywhere else allows more flexibility in the use of the brochure. Having diversity in the finish helps increase visibility and again, communicates quality. Primo Print is one of our favorite online printers. 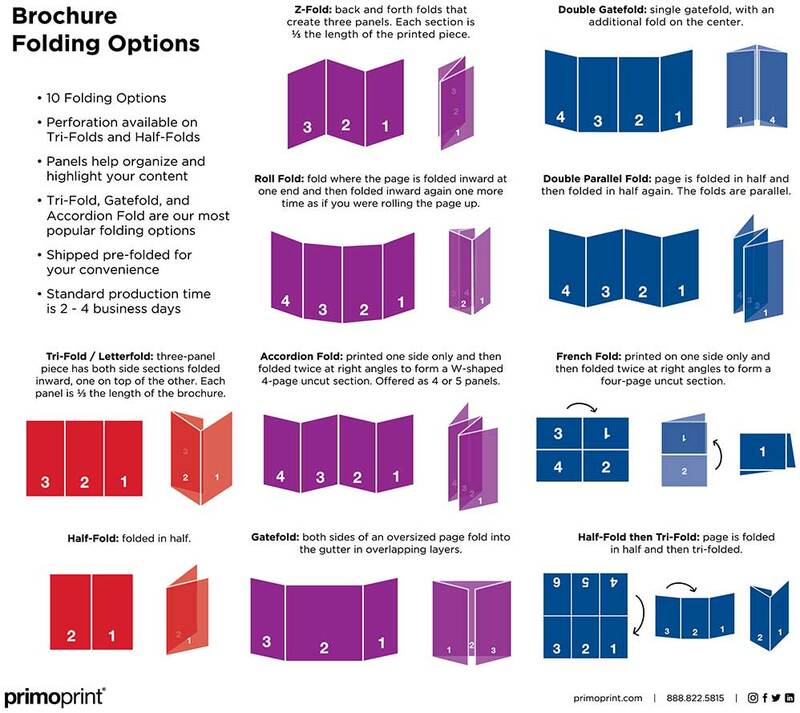 Here are some of the many different types of brochures they print and fold for you.